War has always been one of the major causes of migration, with refugees fleeing countries torn apart by conflict. Most of these refugees hope to return to their country once peace is restored, although obviously (as, for example, our blog on the Polish Government in exile showed) this may turn out to be impossible. In this guest blog, Jill Rutter, a trustee of the Migration Museum Project, writes about one of the less well-known migration stories of the First World War. Most of the events to mark the centenary of the First World War have focused on fallen combatants and battle sites. There has been little commentary about the civilian casualties of the Great War, among them many millions of refugees. But there is much we can learn from the settlement of more than 250,000 Belgian refugees in the UK. Their arrival was the largest refugee movement in British history and, perhaps surprisingly, this country was truly a sanctuary. 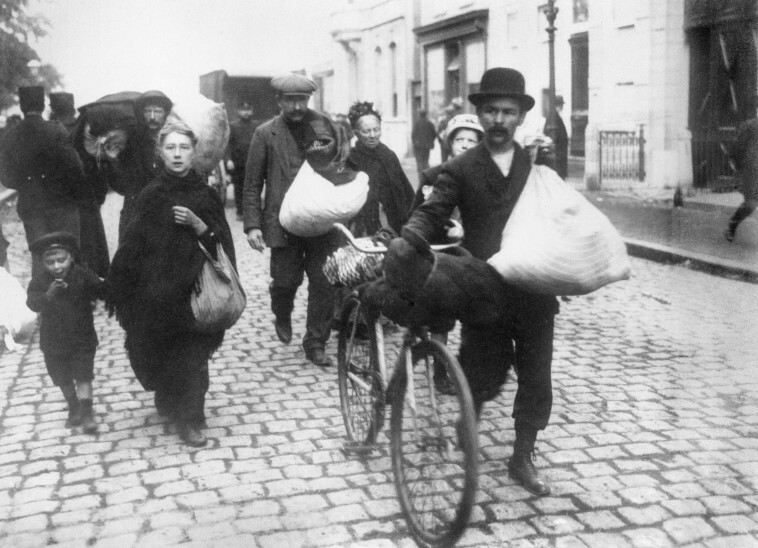 The Belgians started to flee in August 1914, after the German invasion, with most of this group of refugees arriving in the first months of the war. Later in the conflict another 175,000 Belgian soldiers took refuge in the UK, many of them convalescing from war injuries. The newly arrived Belgians were billeted all over the UK, not only to urban areas, but also to small rural market towns. Agatha Christie is said to have based her character, Hercule Poirot, on a Belgian refugee she met in Torquay. 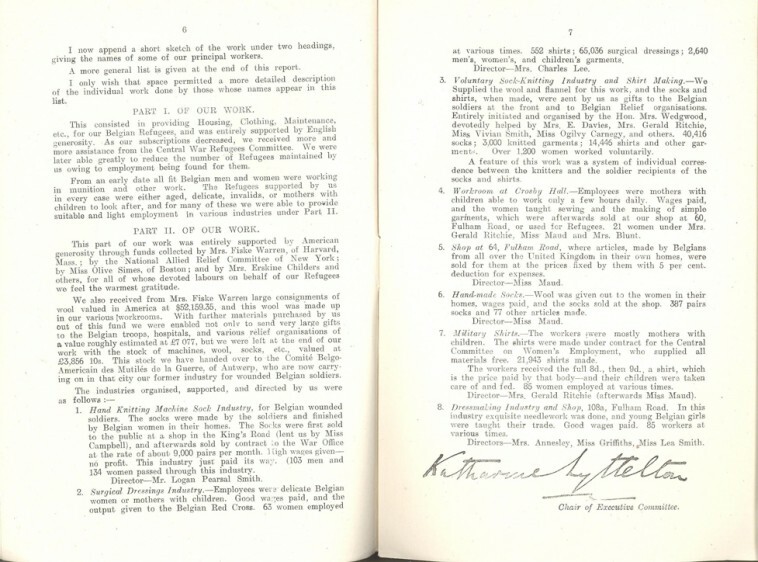 The fullest account of the settlement of Belgian refugees is given in Belgian Refugee Relief in England During the Great War by Peter Calahan. In the last year a number of local museums have mounted exhibitions which include Belgian stories; Otley Museum’s Great War commemorations included a collection of Belgian refugee stories. It was initially a charity – the War Refugees Committee – that assisted these refugees. But by autumn 1914, the charity was overwhelmed and the government took responsibility, with the Local Government Board acting as the lead department. The programme was led by senior civil servants and, at ministerial level, by Walter Long, whose political epitaph largely comprised the successful integration of the Belgians. This was a milestone: the first time that Government had taken policy responsibility for the settlement of refugees. Yvonne van den Broeck, a Belgian child who came to the town with her parents, sister and two brothers. Image thanks to Otley Museum and Archive Trust. Our inspectors say that all over the country these children are finding their way into the elementary schools in a very normal and easy manner … The Belgian children seem very happy at school, through sometimes they do not like leaving their compatriots. (Cited in a report of Local Government Board, 1916). Tensions between Belgian refugees and the host community were rare. The media portrayal of the refugees helped ensure a warm welcome: the Belgians were fleeing the advancing German army and were portrayed as plucky and brave heroes in the popular press. This absence of hostility was even more remarkable because this period of history was marked by growing anti-alienism. The Local Government Board encouraged host communities to set up Belgian Refugee Committees to assist in the resettlement of the refugees. There were 2,500 committees of volunteers by 1916 and there has not been such broad public engagement with the reception migrant reception since then. These committees organised relief for the refugees, providing food, clothing and other assistance. By 1916 the Belgians had started to return home – the 1921 Census recorded fewer than 10,000 Belgian nationals settled in the UK. Save a memorial in the Victoria Embankment, there is now little evidence of this remarkable migratory movement. But at a time when there are concerns about the integration of new migrants and the segregation of our towns and cities, there are lessons to be learned from the reception of the Belgian refugees. In particular, the Government requested that host communities should see it as their responsibility to welcome new arrivals. Perhaps this is a value that we should resurrect today and think about ways we can welcome new migrants. The Belgian Refugee Memorial in London, located on the Embankment opposite Cleopatra’s Needle. Jill Rutter is a trustee of the Migration Museum Project. Moving Up and Getting On, her new book on migrant integration, was published by Policy Press in July 2015.